Diwali Stock Picks – Sensex is shining continuously since last Diwali. YTD return given by Sensex since last Diwali is 13%. The Sensex rally is largely because of the favorable economic condition, political stability, GST implementation and expected reforms by the government. The government has already initiated certain steps to boost economy like allowing FDI, increasing investment etc. The Sensex rally is likely to continue in future and equity investor will continue to laugh. If you are equity investor and looking for good muhurat stock picks here are 10 Diwali Stock Picks 2017-18 by Sharekhan. Sharekhan Diwali Picks of last year turns out to be very good stock for the investor. Almost all stocks have given sparkling returns to the investor. Average returns given by Diwali stock portfolio of sharekhan is 42% against 13% return of Sensex. Only two stocks could not perform rest all stocks have given two digit return to the investor. A stock like L&T Finance has given a magnificent return of 94%. For 2074, Sharekhan has selected 10 quality stocks for Investment. Details of these stocks are given below. Aurobindo Pharma is manufacturing generic pharmaceuticals and active pharmaceutical ingredients. Aurobindo Pharma has multiple products in the pipeline that will boost the growth of the company. The company is expected to reduce debt by the end of FY2018. Aurobindo Pharma is one of the favorite stock of Rakesh Jhunjhunwala. The past performance history of this stock is very good. Bajaj Finserv is leading finance and insurance company. As per Sharekhan Bajaj Finserv has plenty of headroom to grow and can outperform the industry in terms of growth. Sharekhan finds significant long‐term value in Bajaj Finserv and expects its earnings momentum of stock to continue. Bata India is the largest retailer and manufacturer of footwear in India. Bata India has strong brand value and it is well accepted in India. Bata India is a consistent stock performer. Sales and profit margin of the company is growing gradually. The new strategy of transforming from conventional footwear player to branded player is likely to help this stock. IndusInd Bank is leading private sector bank of India. The recent acquisition of Bharat Finance will be beneficial to Indusind bank. The interest income is increasing YOY. Historically IndusInd bank is doing very good on the financial front. As per Sharekhan IndusInd bank is very good stock for investment. KNR Constructions (KNR) is a leading EPC service provider, mainly operating in the roads and highways segment. KNR has in‐house construction capabilities, which ensure project completion on time. KNR balance sheet is strong. KNR Construction is also recommended stock by Porinju Veliyath. TV Today, a leading TV News broadcaster in India, operates four news channels and three FM radio stations. The upcoming election will boost advertising spends. TV Today is an ideal BSE investment bet in the TV broadcasting space. TV today network is Radhakrishna Damani favorite stock. V‐Guard Industries Ltd (V‐Guard) is an established brand in the electrical and household goods space. The company is planning to become pan India player. Sharekhan believes V‐Guard will continue to generate strong cash flow and returns ratios on a sustainable basis to create shareholders value. Sundram Fasteners is the part of TVS group. Sundram Fasteners is leading automotive and industrial player. Sundram Fasteners Ltd (SFL) is introducing new products like engine components, pump assemblies, powder metal parts, and shafts. This would help the company broaden its offerings and outpace industry growth. Upcoming regulatory changes are likely to help Sundram Fasteners in a big way. 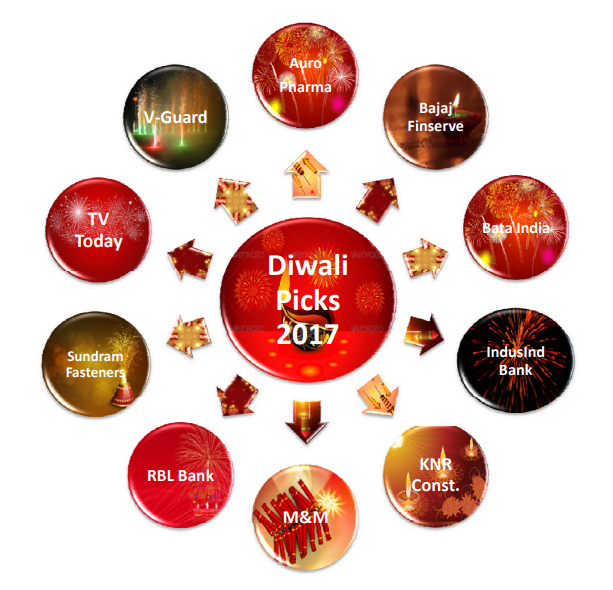 Download Sharekhan Research Report on Diwali Picks from Here. Sharekhan has done an excellent job of recommending quality stocks for the investment.These stocks will surely give a better return in the future.